Here is my travel experience to Germany. 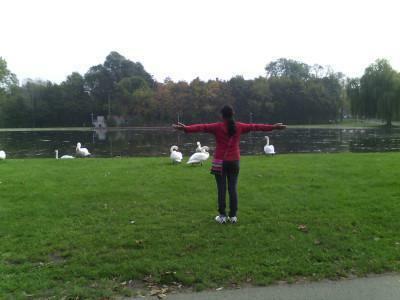 If you are planning to visit Germany anytime soon, read my tips and I am sure it will help you plan your trip. not see any people on the street! Hence that was the summer and people were mostly travelling, Halle is one of the cities known for most of the old people live and the architecture is beautiful and it also has the good history. 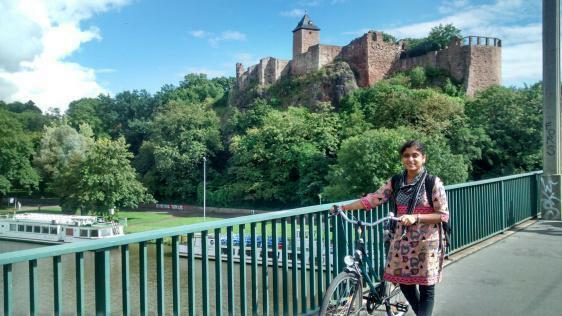 Stayed in Germany for one year in the year of 2014 August to August 2015, I was in totally different world, for my family and villagers it was proud moment and first time a girl from the village went so far away, Yes, I did it and I have selected as international volunteer and I stayed the city called Halle an der Saale. 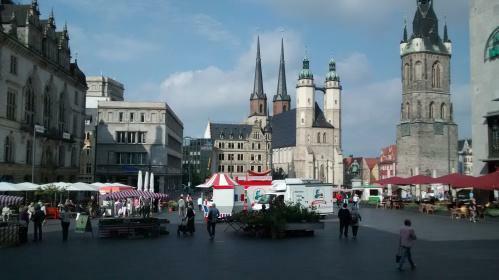 Halle (Saale) situated in the Saxony Anhalt state of East Germany. The name has originated by salt making, also the river Saale used to salt-harvesting, it just contained around 236,991 populations that time. kirche)", built in 1529-1554, along with the "Roter Turm (Red Tower, from the top of this tower you can see the whole city view) is located in the central and besides that there is another market place normally the "flee market" the second hand/antique market takes place, which I loved. In the market place there is a big monument of George Frideric Handel, who is the famous music composer born in Halle. Geiebichenstein Castle, first mentioned in 961, is north of the city centre on a hill above the Saale river, with a museum in the upper castle and the Burg Giebichenstein University of Art and Design in the lower castle. Moritzburg a newer castle, was built between 1484 and 1503. It was the residence of the Archbishops of Magdeburg, was destroyed in the thirty years war, and was a ruin for centuries afterward. Partially reconstructed in 1901-1913, it is an art gallery today. The reconstruction was completed with the opening of new exhibition rooms designed by the Spanish architects Sobejano and Nieto in 2010. On the another part of the city called "Neustadt" known for many migrants and refugees lives there. You can get almost all the facilities within the city, one of my favorite places in the city was the central market place (markt-platz in German) where many creative things, street arts takes place and all the big shops like Galleria, One euro shops are centered, the same place effected during the world war-II. There is one street called Leipziger Straß where there are many nice shops around and on that street vehicles are not allowed, also this street connects to the railway station, another interesting thing is I found out the "Bollywood shop" where the Indian based women running the shop and you will get the Indian stationaries and gifts item, whenever I get bored I used go there and talk with the shopkeeper "Aunty" talk in Hindi just to feel something better. Many people identified me as Indian on the street and used to ask lots of questions about Indian culture! Every day I used to walk to my workplace though I have got a bicycle I like to explore the city by walking, most of the places re walkable distance otherwise the local travels is also very good, very cleaned and systematically maintained streets! On the way to my workplace I see every day many coffee cafes, the oldest University of Germany: Martin Luther University, during the college time I can see many international students as well, also the central post office situated which has the big clock on the top and every day it helps me to track my timings to reach workplace. There were Indian restaurants called house of India and garden of India on the way, also the beautiful city garden located on the way, time to time the flowers and the pond was maintained. During the weekend whenever I am free then I used to go for just walk and I enjoyed that the most because of the many people roaming around and many street arts and events takes place. During December month the whole city decorated and the Christmas market takes place, which you never miss to see, just amazing in the dark winter. When you come to the food, oh god! For the vegetarians it is very difficult, I used to buy the stuffs from the Indian and Asian shops and also from the nearby supermarket called "Penny" which is very cheap comparing to other supermarket, Penny is just 3 minutes from the home where I was staying, I miss shopping in Penny. If I will not mention about the apple then it will not be fair, Yes, I ate apples enough for my whole life, you will get many kinds of apple and I used go to the garden outside the city and pluck the apples , I also eat lots of fresh strawberries and many other kinds of berries. Well, people from other side of Germany used to called as "Dunkle Deauthland (Dark Germany) " to Halle, for me my host family and my guest mother was everything and the house and the separate room given to me was unforgettable, The museum and the Saale river, many churches are good to visit, the authentic food like many kinds of breads are suggested to taste, during the time of Christmas and Latern fest the best time to visit or else summer and autumn seasons are always good. Still remember all the shops and the smiley greetings of the shopkeepers, my favorite streets, many kinds of fruits specially apple and strawberries, my many friends, mainly my guest mother and the house, Halle, I wish I visit you once again in my life.